Background: 5α-Reductase (5AR), an NADPH dependent enzyme, is expressed in most of the prostate epithelial cells. By converting testosterone (T) into more potent androgen dihydrotestosterone (DHT), it plays an important role in men physiology and represents an efficient therapeutic target for androgen-dependent diseases. Over the last few years, significant efforts have been made in order to develop 5AR inhibitors (5ARI) to treat Benign Prostatic Hyperplasia because of excessive production of DHT. Methods: In the present study, 2D and 3D QSAR pharmacophore models have been generated for 5ARI based on known IC50 values with extensive validations. The four featured 2D pharmacophore based PLS model correlated the topological interactions (SsOHE-index); semi empirical (Quadrupole2) and physicochemical descriptors (Mol. Wt, Bromines Count, Chlorines Count) with 5AR inhibitory activity, and has the highest correlation coefficient (r2 = 0.98, q2 =0.84; F = 57.87, pred r2 = 0.88). Internal and external validation was carried out using test and proposed set of compounds. The contribution plot of electrostatic field effects and steric interactions generated by 3D-QSAR showed interesting results in terms of internal and external predictability. 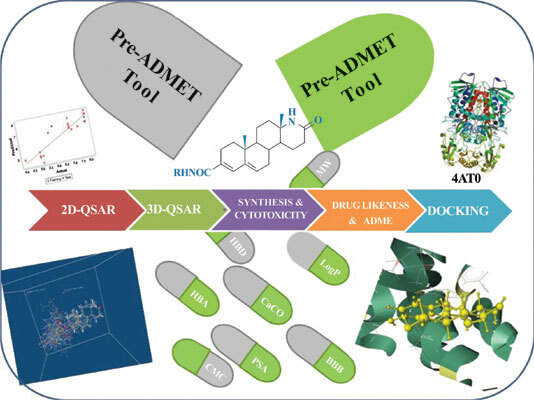 The well-validated 2D PLS, and 3D kNN models were used to search novel 5AR inhibitors with different chemical scaffold. The compounds were further sorted by applying ADMET properties and in vitro cytotoxicity studies against prostate cancer cell lines PC-3. Molecular docking studies have also been employed to investigate the binding interactions and to study the stability of docked conformation in detail. Results: Several important hydrophobic and hydrogen bond interactions with 5AR lead to the identification of active binding sites of 4AT0 protein in the docked complex, which include the gatekeeper residues ALA 63A (Chain A: ALA63), THR 60 A (Chain A: THR60), and ARG 456 A (Chain A: ARG456), at the hinge region. Conclusion: Overall, this study suggests that the proposed compounds have the potential as effective inhibitors for 5AR. Keywords: 5α-reductase inhibitor, Dutasteride, PC-3, Benign prostatic hyperplasia, Testosterone (T), Cytotoxicity. Keywords:5α-reductase inhibitor, Dutasteride, PC-3, Benign prostatic hyperplasia, Testosterone (T), Cytotoxicity. Abstract:Background: 5α-Reductase (5AR), an NADPH dependent enzyme, is expressed in most of the prostate epithelial cells. By converting testosterone (T) into more potent androgen dihydrotestosterone (DHT), it plays an important role in men physiology and represents an efficient therapeutic target for androgen-dependent diseases. Over the last few years, significant efforts have been made in order to develop 5AR inhibitors (5ARI) to treat Benign Prostatic Hyperplasia because of excessive production of DHT.